Very interesting post! Thank you for sharing. I’d like to visit this plantation very much at the end on March. 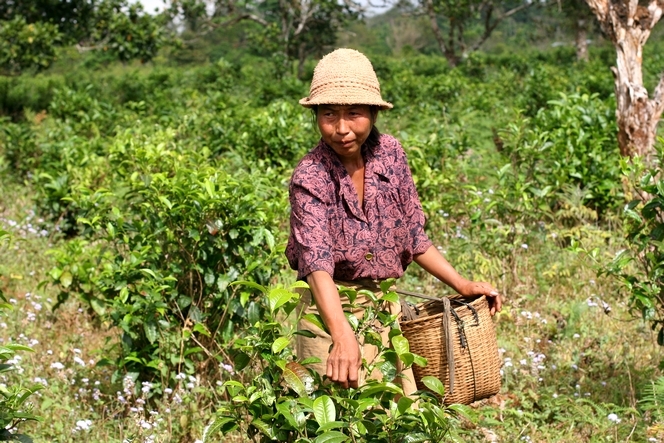 Hoping to buy some black Pu erh from Lao- are there many Pu erh growers in the country? Any USDA organics? Traveling from Ho Chi Minh City, how would you recommend getting there in the shortest amount of time. Only have about 3 days of total time. Any insight about anything Lao Puerh Tea related would be much appreciated! I’m sorry to tell you that they stopped producing such tea now. I don’t know for how long time exactly. It is due to different reasons but among them some dispute between share holders of the factory. So no need to visit there now. By the way it was near Paksong. But for Pu Er the area is at the northest of Laos, at the board with China. And that tea goes to China. Have I read there that this tea is no longer produced? I purchased some last year from palais du thes in Paris and was thinking about buying more. Having visited Laos I found it a charming country and that led my decision to buy some, cemented by the taste! It would be a shame for this delicious tea to fall by the wayside. Maybe I should head over there and set it up again! Dear Angus, that’s a great idea. It’s a pity we can’t find today same tea as last year. I’ve been to Laos recently to meet producers but cooperative is closed now due to many reasons, mostly disagrement between different people. Will keep you updated of course, via my blog.